Who is to pay for the nation’s financial woes: Rich or poor? Contrary to any understanding of natural justice, big business continues to dodge paying their fair share of taxes, leaving the poorest to suffer the consequence of spending cuts and economic slowdown. The Coalition’s commitment to protect the poorest and most vulnerable from the impact of spending cuts was called into question today, by a report from the Institute for Fiscal Studies predicting a big rise in poverty over the next 2-3 years. 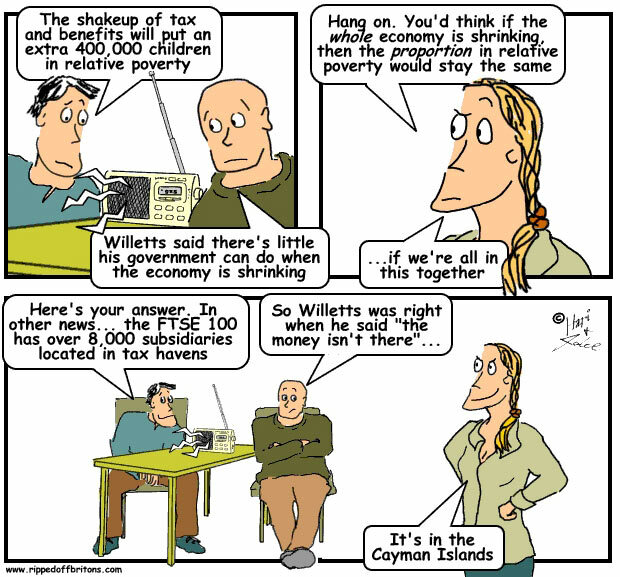 The IFS estimates that a further 400,000 children and 1,700,000 adults will fall below the poverty line by 2015. The impact of changes to personal taxes and benefits announced by the Coalition will directly increase child poverty by 200,000. Whilst the introduction of Universal Credit from 2013 is expected to reduce poverty, this will not be enough to offset the impact of other measures in increasing poverty. At the same time, new research by Action Aid, reveals that £18billion in tax is being lost every year, to corporate tax avoidance by the UK’s biggest businesses. All but two of the top FTSE 100 companies use tax havens, including the state-backed Royal Bank of Scotland and Lloyds Banking Group. The figure of £18 billion lost through corporate tax avoidance is 12 times greater than the £1.5 billion lost through benefit fraud. Later this month, Church Action on Poverty, with a range of partners in the churches, will be launching the next phase of the Close the Gap campaign – targetting corporate tax avoidance, and calling on the Government to take much stronger action to ensure that businesses and the wealthy pay their fair share of taxes. In an age of austerity and spending cuts, tax avoidance is morally unacceptable – it effectively amounts to robbing from the poor. This entry was posted in Uncategorized by niallcooper. Bookmark the permalink.